I have been remiss in my garden reporting duties. A couple of weeks ago I took a picture and it's only just now that I'm posting it. Those were harvested off the improved plum branch I grafted onto my wild Chickasaw plum tree last February. We got about a dozen fruits off that branch and they were delicious. 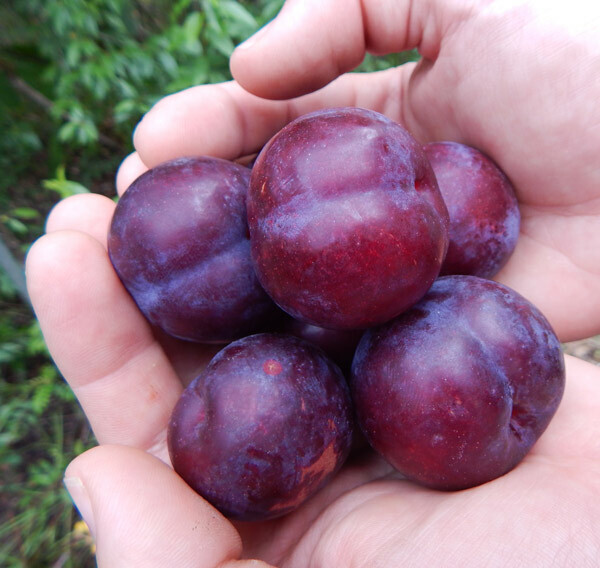 Chickasaw plum is a really scrappy tree that can handle nematodes, drought, poor soil and lots of abuse... unlike most cultivated fruit trees. Taking advantage of its excellent root system by tacking on better fruit makes a lot of sense. You just need to support the resulting branches or else they'll outgrow the rootstock and pull the tree down to the ground. how much sun do the plums need? I'd love to plant one or two, but I'm running out of real estate that isn't shaded..will they do ok in partial sun? Yes - they'll take partial sun; however they'll likely not fruit quite as much depending on coverage.